BMW’s 3-Series Sports Wagon which uses a Touring nameplate outside of North America is getting ready to receive a total makeover. The vehicle had been spied several times before, but there is something special regarding this prototype. 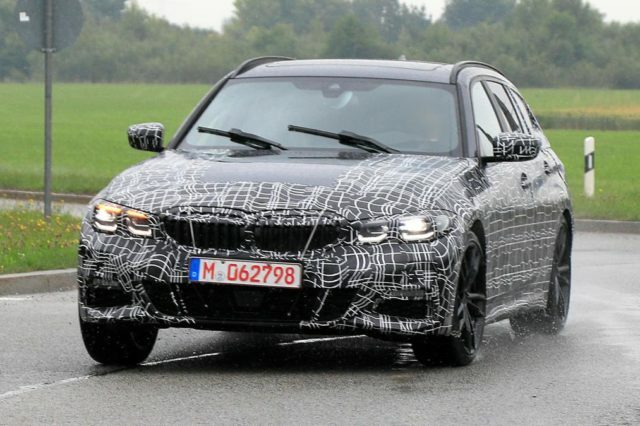 In case you haven’t noticed the car hosts special body kit, as well as blue brake calipers, so it has to be the 2020 BMW 3-Series Sports Wagon M-Performance. 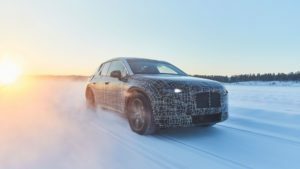 Just as the regular model, the more potent version of the wagon is going to be largely influenced by the next-generation 3-Series sedan. 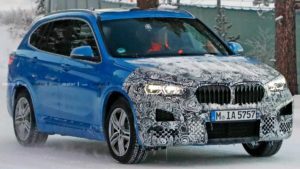 The compact model is almost done and this provides us plenty of information that regards the 2020 BMW 3-Series Sports Wagon M-Performance, too. Styling-wise, the next-gen model will host a range of new details, especially in the front. The redesigned vehicle will look sportier than earlier thanks to the wider and lower front end. In addition, BMW’s iconic kidney grille is still there of course, but it’s definitely different than before. As far as we can see, the restyled grille is somehow narrower and wider. It will also feature active shutters in order to cool off the engine. The new headlights are definitely undergoing an evolutionary redesign as the carmaker decided to keep the drawn-back design. Of course, LED elements are going to be standard. 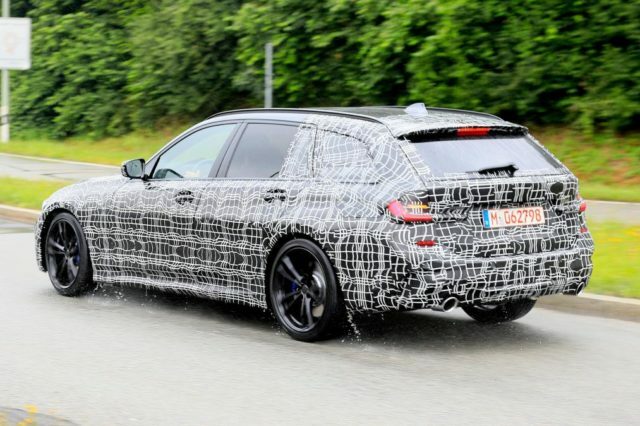 The 2020 BMW 3-Series Sports Wagon M-Performance features significantly longer rooflines than the sedan option, which is quite normal since it needs to offer enough cargo room. We can’t guarantee you, but it looks like the new-gen model gets a few extra inches of length, which will most probably be exploited for cargo volume. The additional inches in length and width will not have any negative influence on car’s weight thanks to a new platform. The redesigned wagon will ride on BMW’s CLAR architecture which uses plenty of lightweight materials such as aluminum and magnesium. This way, the vehicle will lose exactly 88 pounds, which will have a positive influence on the car’s fuel economy. Plus, the CLAR will improve the rigidity of the model, while the wagon should benefit from a 10-millimeter lower ride height. Since it’s highly modular, the new architecture will be able to support plenty of engine options, too. The new U.S.-specs 3-Series Sports Wagon will most likely rely on turbocharged 4- and 6-cylinder inline engines. The standard 330i wagon Bimmer will use the 2.0-liter mill with up to 265 horsepower. This prototype with an M340i M Performance badge uses a 3.0-liter engine that delivers 375 horsepower. You won’t find the RWD model anywhere near the North American ground. No, that’s reserved for the rest of the world. Instead, the U.S-specs model comes paired with AWD and eight-speed automatic transmission only. Some markets will get a diesel-powered Touring model, but there will be no oil-burner here. The redesigned 3-Series Sports Wagon will, on the other hand, get a plug-in hybrid unit instead.